The reason I chose to build a blog application is because it is a basic CRUD application and it is very suitable for easing into PHP and MongoDB web development. We will build a plain user interface using Bootstrap with simple textboxes and buttons. A MongoDB database will store all the content. You can download full source from github, see a demo frontend here and try the demo app’s backend with the user name and password being duythien. According to the official website MongoDB is a document database that provides high performance, high availability, and easy scalability. MongoDB falls into the group of documents-oriented NoSQL databases. For other subtypes of NoSQL databases, see here. Database: MongoDB groups data into databases in the very same way as most relational databases do. If you have any experience with relational databases, you should think of these the same way. In an RDBMS, a database is a set of tables, stored procedures, views, and so on. In MongoDB, a database is a set of collections. A MongoDB database contains one or more collections. For example, a database for a blogging application named blog may typically have the collections articles, authors, comments, categories, and so on. Collection: A collection is the equivalent of an RDBMS table. A collection exists within a single database. Collections do not enforce a schema. Documents within a collection can have different fields. Typically, all documents in a collection have a similar or related purpose. Documents: A record in a MongoDB collection and the basic unit of data in MongoDB. Documents are analogous to JSON objects but exist in the database in a more type-rich format known as BSON. A document contains a set of fields or key-value pairs. The best way to think of a document is as a multidimensional array. In an array, you have a set of keys that map to values (Document == Array). See Documents. MongoDB runs on most platforms and supports 32-bit and 64-bit architectures. MongoDB is available as a binary, or as a package. In production environments, use 64-bit MongoDB binaries. This section will cover installation on Ubuntu Linux and Windows. For other operating systems, please see their documentation. Done, you have successfully installed MongoDB. Now start and stop service MongoDB via command line below. Head on over to the downloads page on the MongoDB official website. Click on the download link for the latest stable release under Windows. After the download is finished, extract and move it into C:\ . MongoDB requires a data folder in which to store its files. The default location for the MongoDB data directory is C:\data\db. If it doesn’t exist, create it. The MongoDB server is built to already work with your current web server, but not PHP. To make PHP talk to the MongoDB server, we are going to need the PHP-MongoDB driver. It is a PHP extension library. Download the ZIP archive https://github.com/mongodb/mongo-php-driver/downloads on your machine and extract it. Copy the php_mongo.dll file from the extracted folder to the PHP extension directory(C:\xampp\php\ext). Save the file and close it. Restart the XAMP. Open up your text editor and add the following code to a new file:<?php phpinfo();?>, save the file as phpinfo.php inside the DocumentRoot of the Apache web server (htdocs) and open the PHP script in the browser. If you see mongo in the PHP info, the installation was successful. Connecting to MongoDB from PHP is very similar to connecting to any other database. The default host is localhost, and the default port is 27017. MongoDB provides rich semantics for reading and manipulating data. CRUD stands for create, read, update, and delete. These terms are the foundation for all interactions with the database. The insert() method stores the data in the collection. The $post array automatically receives a field named _id, which is the autogenerated unique ObjectId of the inserted BSON document. You could also use the save() method, which upserts – updates an existing record, or creates a new one if it doesn’t exist. To get data from a collection, I use the find() method, which gets all the data in a collection. findOne() returns only one document that satisfies the specified query criteria. The following examples will show you how to query one or more records. Modifies an existing document or documents in a collection. By default, the update() method updates a single document. If the multi option is set to true, the method updates all documents that match the query criteria. The update() method takes two parameters. The first is criteria to describe the objects to update and the second the object with which to update the matching records. There is also a third optional parameter whereby you can pass in an array of options. Before we start with our actual PHP code we need to create our files and folders like above. where we define paramaters UserAuth and PasswordAuth to protect the admin folder via HTTP authentication. We’re using HTTP auth for simplicity here, seeing as the central theme of the article is connecting to MongoDB – you would usually use some sort of decent framework with ACL to build in access control. This is the folder that contains the CRUD code. For the full file index.php see here. Above I used the view function in the class layout.php which will automatically load dashboard.view.php. The MongoDB cursor makes pagination easy. These cursor methods can be chained off of the cursor object that find returns and each other. Combining limit with skip makes pagination easy. These can also be combined with order. For example. Comments for an article are stored in an array field of the document name comments. 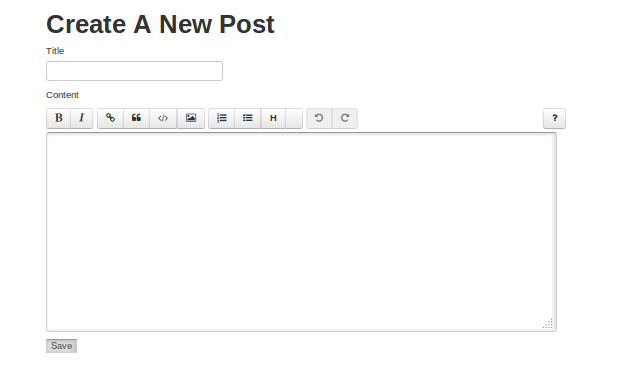 Each element of a comment is an embedded document that contains several fields. 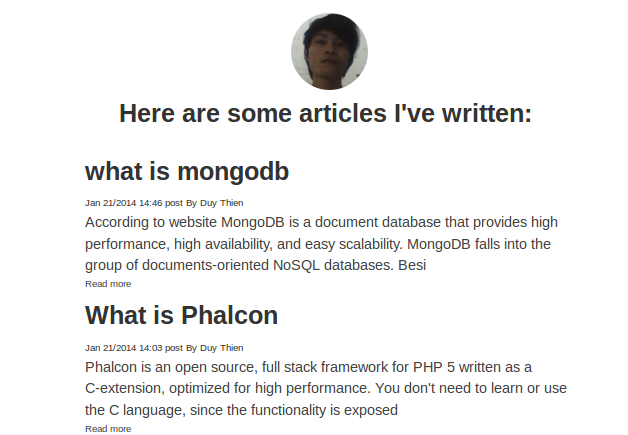 In this article, we covered a basic CRUD introduction into PhP with MongoDB. We’ve even created a sort of very primitive MVC in the process (see full app on Github). It’s up to you to use a proper framework, implement authentication beyond the simple HTTP auth used here, and add more functionality, but the basics are in place and you can hack away at this demo application to your heart’s content. 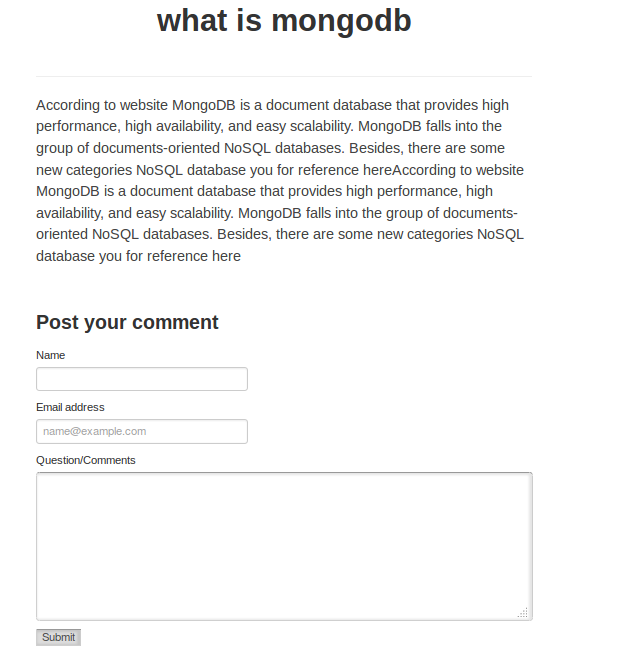 For more information on MongoDB check out the online documentation. Did you enjoy this article? Let us know your thoughts! I'm a professional web developer from Vietnam with B.S Physics and Engineering. I'm a Phalcon enthusiast as Opensource. In free time, I was support on forum Phalcon also my forum and contribution core Phalcon.